The deck turned out better than expected, this can only happen when you find the wright company that can turn a client ideas into reality. These days service, workmanship and professionalism is a rarity, thank you for all of this it has been a pleasure doing business with you and your crew. From all three of us, yip Clarissa was as much part of this process for learning, thank you so much for the outstanding work done. 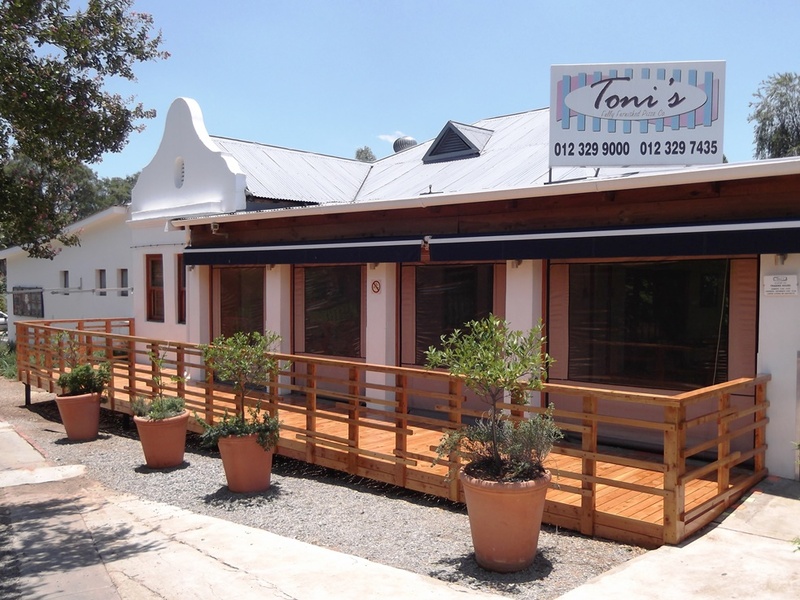 We are super excited by the outcome which truly exceed our expectations. The additions to the home not only adds to the value and enhanced esthetics but the pure enjoyment of the outdoor living areas, for the first time in 14 years, is what really makes the difference. We have so many plans for using the pergola and revamped porch, the latter of which others did not want touch because of the complexity of the structure. Your guidance throughout this process speaks of years of experience and created a product that will last and which best suit our needs. The final result however exceeded our expectation. Thank you for that. I also want to thank you for the ongoing open communication on progress and decisions as well as all the extra work done on the project, overcoming the delay caused by the disintegrating tree that had to be removed, the power interruption and preparing the porch for Clarissa's 21st, knowing that some work will have to be duplicated to accommodate the celebrations in between. We have seen most of the little extra things you have done, but I'm sure there are many others that we have missed. The result is simply spectacular and we thank you and your team for that. We will certainly approach you again when we start with the front of the house. We appreciate your excellent service and I will recommend you to everyone and anyone i know for business ! I need to say this, that we are absolutely happy with the excellent decking job done. It looks awesome and a pleasure to look at. This was the best project we've done so far and it will give us pleasure for many years to come! The colors are super rich and the workmanship perfect and professional. A sincere Thanx from me and the boys at home. Thanx again for completing it in record time and giving me the pleasure of coming back and seeing the finial project. It's good! We are very impressed with your work and you can count us amongst your happy customers. Once again thank you for the very professional manner in which you completed the project. Thanks-a million for as Lezette put it “’n pynloose ervaaring” this makes your company something special. Thanks for the oil that you will give us. Thanks for your email and the information you provided on maintaining the deck, etc. Melissa did give us the DeckWash on Tuesday morning – thanks so much. Thanks so much to all Timbermann personnel for an excellent, and very professional job. You, Melissa, James (and James’ 2 assistants), surely did justice to all the excellent references posted on Timbermann’s website. 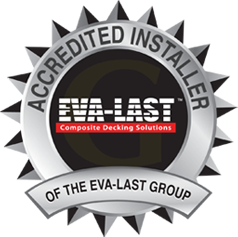 We are extremely satisfied with the deck, and we will always recommend your company. Please advise where / how we can also post a “customer feedback” on Timbermann’s website. Best Regards, and God bless. After all the frustrations on this build, your company was a refreshing change, both in attitude and execution. You are one of the very few contactors that we could recommend with confidence, or use again on a new build. We are truly delighted with the decking, a heartfelt thank you! I was again so impressed with you're company and the way you do business! And the workmanship is awesome! We are extremely happy with the deck. It makes a huge difference to the space around the pool and looks fantastic. Thanks for the advice, as well as the professional and friendly manner in which you and your staff conducted the whole project. You changed my view of contractors. We will definitely strongly recommend you to any prospective clients. We wish you and your family a happy and prosperous new year. George and I would like to thank you for the excellent service we received from yourself and your company for the installation of our decking and pergola. You were on time with meetings and installation and always prompt in returning calls and resolving any concerns we had regarding openings for drainage, gas pipes and general care and maintenance etc. We are very happy with our new decking and pergola and appreciate the additional work you did at our request just short of the Christmas season when you were extremely busy. We moved to Pretoria just short of two years ago and have really battled with every supplier. They have been unprofessional , the workmanship has been poor and their timekeeping shocking. You were a very pleasant surprise and It was a great pleasure to work with you. We will have no hesitation in recommending your company should the opportunity arise. I am extremely happy with my new addition to my house, the deck came out beautifully!! The only thing is that the guys did not cut smooth round curves around the planters, but that is fine I can correct it(Did they cut with a jigsaw?). I would also like to take this opportunity to commend you on the PROFFESIONAL way in which you run and deliver your business, it is a rare quality these days! Also please pass on to your team that there work is also very neat and professional, you are lucky that you have these guys that you can rely on. Lastly, do I have to order the deck wash and deck dressing from you, if so, can you please send me through a quote. Thank you very much and good luck for the rest of the year! Thank you again, This was just a great job. I have never done it before, but I really wanted to pay you a little bit more, because of the quality work you have done for me the last 10 days. I am aware that it took you a day or 2 longer than anticipated, but I wanted to say thank you to you and your guys. I have therefore added an extra R2000. If you could spilt a R1000 between your guys it would be nice but it is up to you. The rest if for you since you really gave me excellent service. Thank you very much for a job well done, yet another Timbermann masterpiece. also for getting your staff to work Saturday to get the job done asap. Please send the final invoice so that I can pay what is due. communication you do. May your business be blessed ! ^ You and your team were on time, every day, and if you were delayed even a few minutes you phoned to let me know...much appreciated! The previous company was late by several hours every day! and NEVER let me know what was happening. ^ The infrastructure you constructed for the new deck has 3x as much timber in it as the previous one and is solid as a rock! unlike the wobbly one that the previous company attached to the tree for support!!! ^ The timber used by Timbermann throughout was properly treated and of excellent quality, unlike that used in the demolished deck which had already started to sag after just 8 weeks! ^ ....and the decking timber is good, solid, perfect planks!... not irregular ones with lots of cracks and bits of bark attached AND even full of woodborer!!!! ^ The finished deck looks just GREAT and I must sincerely thank you (for the regular supervision) and your team (for their hard work) to produce a deck that I am proud to be the owner of! Especially, I must thank you for fitting my job into your busy schedule because of the urgency of removing the existing deck as quickly as possible because of the woodborer problem! It has been an absolute pleasure to deal with a professional outfit like you and your Timbermann team!! Many, many thanks! Ryan Kriedemann is one of our top installation partners and in my opinion one of the best decking contractors in the country, his pricing structure has always been very reasonable and I would trust his judgement with regard to every aspect of any decking requirement. We have only received fantastic reviews from clients he has worked with and I can promise you that you are in very experienced and capable hands when dealing with Ryan. I have attached a couple of customer warranty registrations from the last couple of months where Ryan has done the work for the clients and I believe the comments reflect the calibre of person that you are dealing with. Thanks Ryan, really like the look! Will send you pics and affect payment today. Please use me as a reference in future. Great to deal with a professional. Thank you for your great service. The desk look superb. Bad news about the furniture hey! LOL…I appreciate the bit of discount on the railings and gate. Thanks once again and best of luck with your business. Thank you for a job well done it’s stunning, everyone who has seen it so far is seriously impressed, in fact I have referred 2 people to your web site and gave them your phone number as well. Cheryl has already done a payment last night and the final transfer will go through tonight. Stay in touch and keep us on your newspage. Thanks so much for the excellent , friendly and professional service ! The deck looks fantastic, and we are very happy. Thanks for being fair on the invoice. I have just made payment of the balance due, and proof of payment is attached. All the best over the festive season, and for 2013 ! 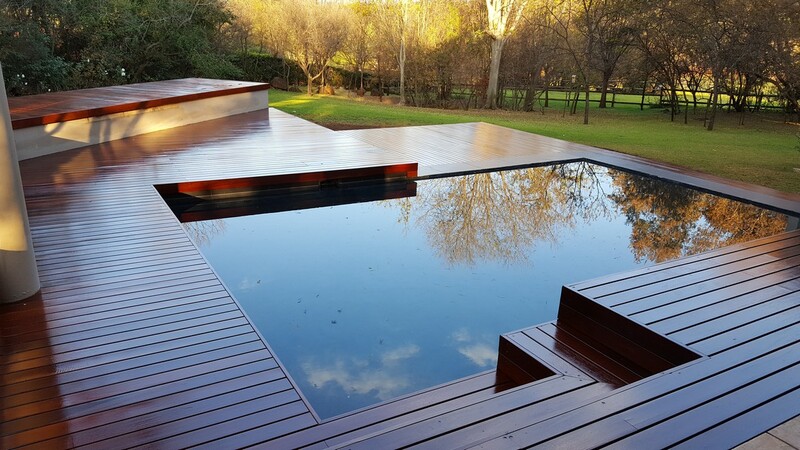 The Red Ironwood Deck looks FABULOUS - It far exeeds our highest expectations. Attached proof of final payment. Thanks a million for your professional approach & outstanding Service! Also sincere thanks to Amos & Alfred - they are such dedicated people, professional yet shows such humility. The owner of Camp-A-Tent came her for a quote & compliments were pouring. Your products serves as its own marketing! I am back in the land of the free (Zuma). The decking looks amazing, and I am very pleased. I noticed that you are advertising in the local estate magazine now. I hope it brings you a lot of business. You are welcome to use my site as a reference site along with taking potential clients for a viewing. Thank you for the deckwash. I will settle your account over the weekend. We are also very happy with the deck and we were really impressed with how quickly you managed to get on site and get the job done. This was a very professional job, thanks. I attach proof of payment for the balance. Have a wonderful Christmas and all the best for 2011. Thanks so much for a great job done – it looks awesome and I’m very happy. Thank you to you and your team for the outstanding job you have done for us. Our deck is stunning and we can't wait to start using it. Please dont forget to send me those pics you promised. I am in love with my decking, thank you so much, an amazing job done. Very seldom In this country can you say this but it is the first time I have had work done whereby I am so happy. Thank you again. You can send me the invoice for payment. I will let know in due course when I want my front area done. Thank you the deck looks perfect. I want to take the opportunity to congratulate you on your professionalism and quality of work! In SA we do not get this often and we need to mention these rare occasions to one another if it comes along. 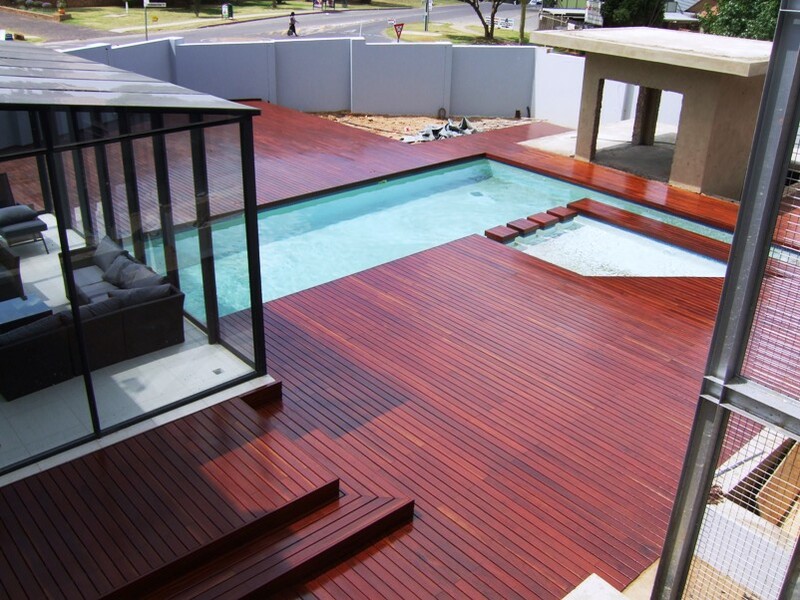 I will definitely recommend you to anyone “in my little world” who want to do some decking. Thanks again. We are so pleased with the outcome and can’t wait to use the deck. You have a wonderful team, special thanks to James. The deck certainly exceeded our expectations.